Elena Govor, Russian roots are hidden in Anzac history. - International New York Times, 18 September 2014, p. S3. Worried to death. A Russian's suicide. - The Advertiser, Adelaide, 19 April 1919, p. 7. Soldier commits suicide on board a transport. 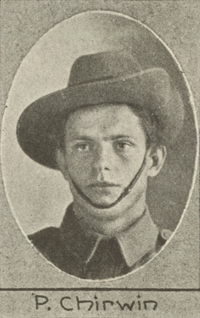 Mates called him "Bolshevy".. - Barrier Miner Broken Hill, 19 April 1919, p. 9. Pathetic suicide of Russian-Australian soldier. - The Daily News, Perth, 23 April 1919, p. 4. "True to Australia". A Russian's death. - Northern Star, Lismore, 23 April 1919, p. 5. Russian digger's suicide. - Recorder, Port Pirie, 28 April 1919, p. 3. Soldier suicides. - Truth, Brisbane, 4 May 1919, p. 9. The making of a Bolshevik. - Daily Standard, Brisbane, 24 July 1919, p. 4. There were people aboard the Anchises who knew that the emphases in this testimony had been adjusted: it was not the Queensland bolsheviks that Chirvin feared, it was his comrades on board the ship. Chirvin had served four years in the AIF, from Gallipoli to France; he was wounded twice and received a Military Medal for his courage as a stretcher-bearer at St Quentin. The day before his death he went to see Lieutenant-Colonel J.S. Denton, who testified, 'he told me that he was being heckled about his nationality. He being a Russian, his comrades calling him "Bolshie". On this point I tried to obtain the names of the offenders but he refused me the information. He served under me in the 49th Battalion & his conduct was exemplary.' Chirvin also told Surgeon L.W. Bond, in whose care he was at the time, that 'his comrades had subjected him to a lot of "ragging" about his Russian parentage'. He told both Denton and Bond he intended to commit suicide. Chirvin left behind a widowed mother, a peasant woman, in Vladivostok. In 1916, as he headed for France, he had written to her, 'I beg you once more not to worry too much, I think we shall see each other again'. His mother would never forget him and, in spite of all the difficulties facing her, kept trying throughout the 1920s to obtain information from the Australian military about his 'personal effects' and the cause of his death. All she ever got was his medals and some money. As for the court of inquiry -- the coroner returned a verdict of suicide and no action was taken to find the 'offenders'. They went home, jubilant conquerors, to reunite with their loved ones. 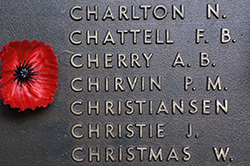 Chirvin was buried at the North Head Quarantine Cemetery.